With the development of the civilization every activity of human have become dependent on economic. National Income is one of the importance part of National economic. To know about countries economical strengths we get to have Ides of national income. It has great significant in our daily socio-economic life. Bangladesh is a developing country our total progress depend on some fixed thing that are agriculture, industries, state owned Enterprise, Power and energy, transport and communication and human resource development . Our economic totally depend on these sectors. National income ascertains a country prosperity. i. To know about economical situation. iii. To find out deficit between export income and import expenditure. iv. Find out shortcoming of economic. There has been extensive literature in the field of agriculture in Bangladesh. In this purpose, I have seen some research paper and many index related the subject. I find the subject different ways. Some of the have been mentioned national income is sum of wages rent, interest and profit or the sum of goods and service produced by the economic during one income period. GDP: GDP is one of the important part of national income. 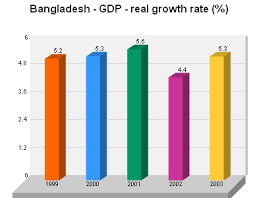 According to the final estimate of Bangladesh of statistics the country had achieved GDP growth of 5.74% in FY 2008-09 amid unprecedented global financial crisis. BBS revised the provisional estimate of GDP growth at 5.83% for fiscal year 2009-10. However , based on updated trend of macroeconomic indicators the medium term macroeconomic framework projected 6.0% GDJP growth for the same period. MTMF considered positive trend in export earning, increased production of agriculture and industrial credit and the growth of imports of capital machinery and industrial raw materials for the projection of GDP growth. Moreover the MTMF envisaged that the growth of GDJP for fiscal year 2010-11 will be 6.7 % which will gradually increase to 7.2% and 7.6% in the fiscal year 2011-12 and 2012-13 respectively. As per vision 2021, the government will try to achieve 8% growth of GDP in 2013 and 10% in 2017. The GDP growth rate at constant prices and per capita GDP. Another important sector of national income is remittance. According to the bureau of manpower, employment and training a total of about 70 lakh Bangladeshi workers went overseas during 1976 to June 2010. A total of 4.27 lakh Bangladeshi worker went abroad for employment in FY 2009-10 which is 34.34 % lower than the previous fiscal year. In FY 2006-09 the remittances from expateiats Bangladeshi workers stood at US$ 9689.16 Million reflecting 22.42%. rise over the previous year. In 2009-10 remittances shot to US$ 10987.4 Million reflecting 13.4 % rise over preceding year. According to the world bank report on migration and remittance trend 2009. Bangladesh secured 12th position among the remittance earning countries in 2008. In 2009 Bangladesh secured the 8th position in this year Bangladesh earn 2.55 % of the world remittance. According to the revised estimate of GDP by BBS for FY 2009-10, the contribution of these sub sectors namely crops and vegetables livestock and forestry are 11.34% , 2.60% and 1.4%. Is indispensable for rapid and sustainable economic development industry therefore is an important sector of the economy the contribution of the industry sector to real GDP was 17.31% which has increased to 29.88% in FY 2009-10 according to BBS.  Economic survey of Bangladesh.  Forest and related service.  Electrify, gas and water supply.  Renting and business activities.  Public administration and defense.  Social and personal service activities. If we want to describe about national income accounting first we get to describe about agriculture industry human resource. 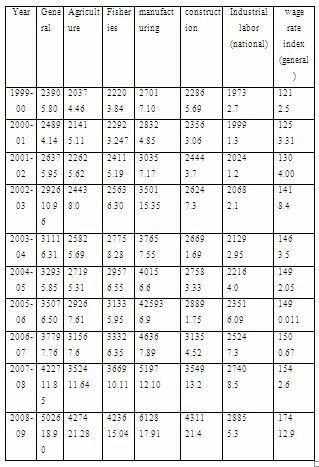 Table one shown the production increases but the table -4 shows the conurbation the agriculture are decreasing but growth rate is increasing, for this reason sector share of GDP of agriculture are increasing. on the other hand manufacturing production are increasing and sectoral growth rate are increasing as well. Moreover industrial contribution are increasing from the service sector we can see it become most important sector in national income. However contribution of the service sector weathered such fluctuation and remained unchanged at 49-50 % during the same period. By analysis the sect oral growth rate within the period it has been observed that unit FY 2008-09 industry sector should as increasing trend of growth compared to agriculture n FY 2009-10 the agriculture and service sector were expected to grow by 0.55% the growth of the industry sector would decline by 0.45 %. The amount of remittances in rearms of GDP and export earnings have also increased over the year. In FY 2003-04 remittances as percent of GDP and export stood at 5.98 % and 44.47 % respectively. In FY 2009-10 remittances as present of GDP and export were 11.13% and 67.80% respectively that show. This report was aimed at evaluating the performance of “National Income” the performance of the investment forums has been evaluated with respect to different performance dimensions such as Profitability, risk, possibility, operating efficiency etc. as part of the evaluation, the strategies followed by the different countries investors have also been analyzed. After the evaluation is completed comments have been made on the performance of the direct foreign investors in the country to country on the basis of the result found in the analysis. By observing the different possibilities ratios it is observed that the country to country is performing well to increase its profit with a positive fund, Similarly the efficiency f the direct foreign investment , it is observed that investment foreign country is performing efficiently increasing with positive trend in Bangladesh, The employee productivity in terms of net operating income the overall investment system of the foreign country are also satisfactory and finally the system is satisfactory in Bangladesh, By summing these analyses we can say they the fore20ing country perform will in terms of profitability & possibilities and regulatory point of view and with the pace of the passage of time. At present the investment opportunity in our country is facing not only the indigenous investment competition lent also it is merging toward global investment competition over time. For the question of survival, management, efficiency, capital adequacy and better diversified services are regarded as the priority concerns for the opportunities of the direct foreign investment in Bangladesh.